Team Ray Fight Corporation(TRFC), established in 2006 manages and promotes world –class local and international professional fighters hosting development and professional tournaments world-wide. TRFC works in close association with the World Professional Muay Thai Federation (WPMF) to promote top local entertainment and is associated with the best airline carriers and hotels. All TRFC events are broadcast on South African television, providing excellent exposure for our proud sponsors. TRFC hosted its first professional K-1 Rules tournament in 2006 and less than 2 months later, the first international Muay Thai tournament featuring experienced fighters from Thailand. Both events were hugely successful and TRFC has been going from strength to strength ever since. In 2007 TRFC hosted the first all-womens’ full contact development fight tournament called FIGHT GIRLS SOUTH AFRICA providing tough but feminine women fighters with a platform to show their skills in the ring. While the female fighters enjoy much needed exposure through radio and television broadcasting, spectatorship has tripled since the start of this exciting project. With women all over the world turning to Muay Thai for fitness and self defense, more women are taking the step to get into the ring to fight. FGSA has forced local and international fight fans to take talented women fighters seriously and the phenomenon continues to draw people to these exhilarating tournaments. TRFC is responsible for exciting pro tournaments including Fight Night Africa: SA vs Thailand and the highly anticipated SONS OF AFRICA held at the prestigious Cape Town International Convention Centre(CTICC) featuring 2 Muay Thai world title fights . 5x World Heavyweight Muay Thai Champion Ramazan “The Punisher” Ramazanov from Russia made his first appearance in South Africa at the event in front of a crowd of appreciative fans and this was also where local fighter Rayana Ameeroedien became South Africa’s first female to win a world title in the sport of Muay Thai. Besides providing excellent opportunities for athletes to compete at professionally run tournaments and to promote the sport, the goal of every TRFC event is to promote the awareness of important social issues including “WOMEN STAND UP” and “STOP CRUELTY TO ANIMALS”. A dynamic business and sports woman who has taken the South African fight industry by storm… Rayana Ameeroedien started her fighting career more than 10 years ago while studying Psychology at the University of the Western Cape in Cape Town, South Africa. She began her training in a gym full of professional boxers and kickboxers, mainly heavyweights including the likes of heavyweight world champion, Mike Bernardo. Her initial intention to keep fit and build confidence soon turned into a love for full contact fighting. After a number of amateur kickboxing, boxing and Muay Thai fights she turned pro and won the title of South African Muay Thai Bantamweight Champion in 2001. Rayana’s passion for Muay Thai escalated after a visit to Thailand to train with Thai champion Sakmonkol at the ISS gym in Pattaya and has developed her skills over the years with annual trips to Thailand ever since. She gained valuable coaching experience through opportunities to travel to some of the world’s best Muay Thai boxing gyms in Thailand, Switzerland, Croatia, Malaysia, the UK and Hong Kong. Ray now has her sites set on training camps in Holland, Australia, Japan and the USA which she feels will add to her knowledge and confidence as a trainer. In 2008 Rayana won her 1st world title under the World Professional Muay Thai Federation organization in South Africa when she fought Nong Karn for the second time, winning by knockout in the second round at the packed CTICC (Cape Town International Convention Centre). The two women fought for the second time after a nail-biting first face off in Thailand going the full 5 rounds which saw Nong Karn winning on a close points decision in her home town. Rayana has since gone from strength to strength and is by far the most established professional female fighter, trainer and ambassador for Muay Thai in South Africa. She has been making waves on the international fight circuit for years and been highly successful as a promoter hosting events at prestigious venues in Cape Town including Ratanga Junction, the CTICC, the Royal Cape Yacht Club, Table Bay Hotel, The Vineyard Hotel, to name a few. She has personally trained some of South Africa's most successful fighters including the likes of Irshaad Sayed, Ferial Ameeroedien and Ncedo Gomba. Rays amateur fighters continue their dominance on the local fight scene since 2001. Rayana is affiliated with well-known fighters including 7x World Heavyweight Champion Ramazan "The Punisher" Ramazanov and has trained with the likes of Buakaw, 3x K-1 Max Champion and Thailand's most famous Muay Thai fighter. With a wealth of experience under her belt established over the last 14 years Rayana still finds time to compete whenever possible. She has recently turned her attention to MMA (Mixed Martial Arts) and will compete in her first MMA fight under the guidance of Stanley Phan during 2013. 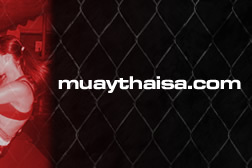 RAYS Muay Thai Academy has provided coaching for hundreds of men, women and children for fitness over the years and is proud to have developed both South African and World Champions since 1999. Rayana received her professional promoter’s license in 2006 and has directly contributed to the growing popularity of Muay Thai in South Africa – she is the only fight promoter to have ALL her promotions (tournaments), both professional and development, broadcast on national television. Rayana founded SAMO (South African Muay Thai Organization) which works closely with the WPMF (World Professional Muay Thai Federation) in promoting and sanctioning professional Muay Thai tournaments in South Africa. 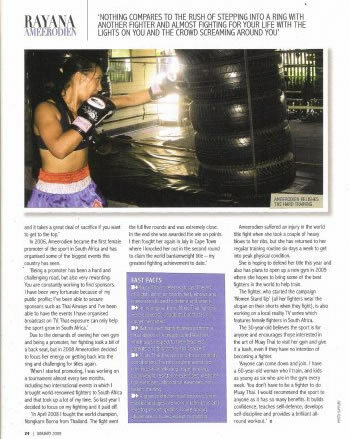 In 2009 she initiated the amateur leg of the organization, SAMDO (South African Muay Thai Development Organization) to facilitate the development of the sport in the country and to provide opportunities for young up and comping fighters.In 2008 she secured Thai Airways as a main sponsor and continues to work with only the best hotels in South Africa and Thailand. Rayana and her fighters are dedicated to a special project coaching street children at no charge. The team regularly visit local schools to perform exciting Muay Thai demonstrations and motivational speaking. 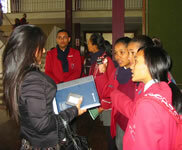 The benefit for learners: education on safety and the importance of saying no to drugs. Rayana has become a spokesperson for women’s rights and features the slogan “WOMEN STAND UP” at all tournaments. It is a personal goal to see women fighters enjoy better exposure and she has been very active in promoting talented female fighters both locally and internationally. 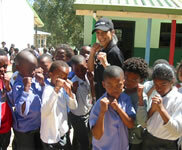 In 2007 Rayana started FIGHT GIRLS SOUTH AFRICA, South Africa’s first all-women martial arts tournament. For the first time women fighters were featured on a fight bill as the MAIN attraction. The presence of feminine but tough women in the ring participating in brutal full contact fights amazed spectators. The event has become so popular that a documentary on Muay Thai and the local and international women fighters promoted by TRFC has been initiated. Rayana’s achievements include being a finalist in the 2006 Extraordinary Women Awards hosted by the City of Cape Town with Mayor Helen Zille as the guest of honour (November ’06) and voted as one of Cosmopolitan Magazine’s 30 Most Awesome Women (Dec ‘06 issue). She has appeared on TV programmes including DSTV’s Kwela, SABC’s World Of Winners, often appears on SABC 2’s Women In Sport programme promoting Muay Thai; and ‘Power Within’ on SABC3 received the rights to interview and broadcast her world title fight in July 2008. Her most recent achievements include a nomination for the Shoprite/Checkers Woman Of the Year Award (May ’08) and a spot on Sports Illustrated Magazine’s 10 “Beauties of Sport” (June’08 issue). In November 2008 she was nominated as a finalist for the SASCOC (South African Sports Confederation Olympic Committee) Sports woman of the year award, alongside swimming sensation Natalie Du Toit; and made South African history when she won the WPMF Womens’ World Muay Thai title in July 2008.